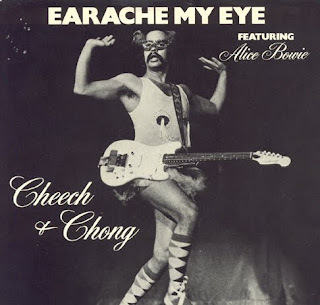 Novelty hits always did well here in Chicago ... and "Earache My Eye" by the comedy duo Cheech and Chong was no exception. Known primarily as a best-selling ALBUM act, Cheech and Chong scored three straight chart-topping hits here in Chi-Town ... "Basketball Jones", a #13 National Hit and "Sister Mary Elephant", which peaked at #24 in Billboard Magazine, BOTH soared all the way to the #2 Spot here in Chicagoland ... and this one, "Earache My Eye", went all the way to #1. Another popular Top Ten Hit that you rarely hear anymore was "Who Do You Think You Are" by Bo Donaldson and the Heywoods, the follow-up to their chart-topping hit "Billy, Don't Be A Hero". Wrapping up the "abbreviated" Top 15 WLS MusicRadio Chart this week is my all-time favorite Osmonds song, "Love Me For A Reason". (Despite ten Top Ten National Hits ... and now a hit Las Vegas stage act featuring Donny and Marie ... you don't hear much Osmonds Music on the Oldies Stations anymore ... but for a while there, they went toe-to-toe with The Jackson Five for the teeny-bopper market. Certainly Top Ten smashes like "One Bad Apple", "Yo Yo", "Down By The Lazy River" and this one, "Love Me For A Reason", deserve a spin every once in a while!) In fact, speaking of Donny and Marie, you'll find this duo still hanging on the chart with their remake of the old Dale and Grace tune, "I'm Leaving It All Up To You". Olivia Newton-John would hold down the #1 Top Spot for a total of three weeks before she would be displaced by First Class and THEIR big One Hit Wonder, "Beach Baby". "Rock Me Gently", sung by Andy Kim (rather than a forest preserve full of animals as it is THESE days) held down the #7 spot ... his record topped the WLS Chart two weeks earlier. A quick glance at the Album Chart (showing LPs and Tapes ... lol ... jeez, how dated does THAT look nowadays!!! lol) shows Bachman-Turner Overdrive with TWO of the Top Four Albums this week ... "Not Fragile" is in at #1 and "Bachman-Turner Overdrive II" is holding down the #4 spot. And The Beach Boys were back on the comeback trails with their hits collection "Endless Summer", too. It debuted at #9 this week and would help to launch a whole new generation of Beach Boys fans in the weeks to come. Funny you should bring that up ... I've been working on compiling a list of sources for a planned set of CDs that will include every instrumental to make the Hot 100 during the '60s (more than 560 songs, on 23 CDs). I'm finding that there are quite a few (particularly lower charting records) that aren't available on CD, or what is are not the single versions. But to answer your question: Since by "All-Time" I assume you mean the usual time period of 1955-1979, that would preclude using "SuperChart" data specifically, since they go back only to 1960 (so far). I could put together a list from my annual charts compiled from Billboard and Cash Box data ... let me know if you want me to go outside the time period stated -- I could go back as far as 1950 and forward as far as 1992, although I don't think there have been any instrumentals that would qualify since 1986. 1955 - 1979, the time period normally associated with Forgotten Hits, will be fine. As noted by Joel Whitburn yesterday, NOTHING post-1985 would have made the "All Time" List anyway! Thanks, Randy! NOTE: Chart statistician Randy Price has compiled EXCLUSIVELY for us here in Forgotten Hits the OFFICIAL ranking of the Top 40 Instrumental Hits, 1955 - 1979, based on a COMBINED ranking of the Billboard and Cash Box Charts for this period. This chart is copyright Randy Price and Forgotten Hits, 2009, and may not be used without express written consent from both parties. How about Joe Kenton with the instrumental called Hymne? For those who aren't that familiar, it was the song used in the Gallo Wines commercial years ago? You've hit on a topic that I discuss from time to time when posting old top 40 surveys on ebay. You just don't hear instrumentals on the radio any longer, even on oldies radio. They're used as a filler to bridge the gap to news, or as intros or outros to other scheduled programs. In your most recent email, a number of songs were listed and you hear NONE of them. I think all I've heard in recent months are Rise, Classical Gas and Feels So Good. What about all the great surf instrumentals, or Rumble, by Link Wray? I just finished listing a bunch of WBBM-FM surveys from 1973. A couple great instrumentals from that time were Hocus Pocus and Frankenstein. The lack of instrumentals on the radio explains why guitarists like Joe Satriani, Eric Johnson, Steve Vai, Steve Morse, Steve Stevens, Richie Sambora, Mike Campbell, John 5 and others don't have million selling albums. Unless Jimmy Page can persuade Robert Plant to get back together with him, he might as well go back to being a session guitarist. Eddie Van Halen's career is done unless he can find another singer. Forget about instrumentals like Let There Be Drums. Not even Phil Collins could get away with an LP of instrumentals featuring the drums. Would an Elton John or Billy Joel album of keyboard dominated instrumentals fly? It wouldn't.It's probably a vicious circle. Radio says there aren't any great instrumentals being released and the artists will say radio doesn't play it anyways. I think the second half of the statement is more true. Instrumental albums are made all the time, but outside of guitar magazines, you never hear about them. A couple more nobody mentioned:"Wipe Out" and "Mizry Lou"(sp? )I had forgotten about and had a few records by Sandy Nelson and Art Blakey. You never hear drum solos much anymore, if ever, even live. Click here: True Oldies Channel . Not sure if I missed it or not but wasn't "Sleep Walk" an instrumental? Santo and Johnny, 1959, I believe. Some great tunes everyone's mentioned. Thanks again for all you do and thanks to everyone else for their input every week. Sure makes interesting reading. Yep, one of MY all-time favorites, too ... and definitely part of the "Vintage Instrumental" Class of the late '50's and early '60's ... but we were trying to figure out how many "big hit" instrumentals came out post 1973 ... and the drop-off is far greater than many of you may realize. According to Joel Whitburn's "Top Pop Singles" Book, NO instrumental has topped Billboard's Hot 100 Singles Chart since 1985 when Jan Hammer did it with his "Miami Vice" Theme. Think about that for a second ... that's nearly 25 years ago!!! By comparison, during the first 25 years of The Rock Era, 29 instrumentals topped the chart. I would like to comment on your instrumental discussion. Instrumentals, especially early rock and roll tunes, have always been favorites of mine. I can’t imagine any talk about the golden era of 1950’s rock and roll without a mention of instrumental smash hits like “Honky Tonk”, “Raunchy”, “Tequila”, “Rebel-‘Rouser”, “Topsy II”, “Teen Beat”, “Red River Rock”, “The Happy Organ”, “Rumble” or “Guitar Boogie Shuffle”. Here’s a bit of history about the impact of instrumentals on Billboard’s pop charts. There have been only four that charted this decade (2000’s): “Kernkraft 400” by Zombie Nation (#99/’00); “Sandstorm” by Zarude (#83/01), “Axel F” by Crazy Frog (#50/’05), and “The Simpsons Theme” by Green Day (#106/07). The 1990’s had 27, the biggest being “Theme From Mission: Impossible” by Adam Clayton & Larry Mullen of U2 (it peaked at #7 in 1996 and was the only Top 10 instrumental of the decade). The 1980’s had a total of 53 and it was the last decade to score with a #1 instrumental hit: “Miami Vice Theme” by Jan Hammer in 1985. There were a total of 250 charted instrumentals in the 1970’s which included 11 #1’s: from “Frankenstein” by the Edgar Winter Group in 1973 to “Rise” by Herb Alpert in 1979. The 1960’s decade was truly the golden age of instrumentals. A total of 786 instrumentals made the “Hot 100” and “Bubbling Under” charts. 1962 holds the crown with a total of 118 entries, featuring three #1’s: “Telstar”, “Stranger On The Shore” and “The Stripper”. The 1950’s had a total of 356 instrumentals. 1959 was the top year of that decade with 76 titles. Many all-time classic #1 instrumental hits came from that decade. Among them were “The 3rd Man Theme”, “Blue Tango”, “Cherry Pink And Apple Blossom White”, “Autumn Leaves”, “The Poor People Of Paris”, “Lisbon Antigua”, “Patricia” and “Sleep Walk”. And, a quick glance at the 535 #1 hits from 1920 through 1949, shows that 61 of that total were instrumentals – from “Dardanella” and “Whispering” in 1920 to “In The Mood” and “Frenesi” in 1940. So, there it is - a capsule wrap-up of the chart history of instrumental recordings on America’s pop charts. It was these recordings that inspired me to buy a guitar and learn to play all of these great rock and roll instrumentals. 1. Connie Francis - 41 Top 40 Hits including 16 Top 10's and three #1's ... with Brenda Lee, one half of Rock And Roll's Female Dynamic Duo. How is it even REMOTELY possible that Connie is NOT in The Rock And Roll Hall Of Fame?!?!?! 3. Guess Who - 15 Top 40 Hits including six Top 10's and one #1 ... the biggest selling act to EVER come out of Canada, at one point selling more records than ALL of the other Canadian recording artists combined! 5. Chicago - 34 Top 40 Hits ... fused jazz and rock into a successful career that is now in its FIFTH decade! At one point, Jimi Hendrix said of Chicago Lead Guitarist Terry Kath, "I think your guitar player plays better than I do!" Jimi's in ... yet Chicago has never even been nominated!!! 6. Pat Boone - 39 Top 40 Hits ... second only to Elvis in record sales throughout the '50's ... made Rock And Roll Music acceptable to mainstream America who felt threatened by Elvis' much harder (and more sexual) image. Introduced much of White America to the sounds of Black R & B Artists through his recordings of songs first made popular by Rock And Roll Hall Of Fame Artists like Fats Domino and Little Richard. Did more to help bridge the gap between White America and Black America than ANY politician or Civil Rights Leader EVER did. 7. Chubby Checker - The ONLY artist in Rock And Roll History to reach #1 TWICE with the same record. Caused a national dance sensation when he taught us "The Twist". And, if that's STILL not enough, scored 22 OTHER Top 40 Hits!!! 8. The Moody Blues - Started as a blues band covering an old Bessie Smith song ... and evolved into one of the pioneers of orchestral rock. Breath Deep ... how can you possibly NOT induct THESE guys?!?!? 10. The Monkees - Eternally popular TV / Music stars. No, they DIDN'T play their own instruments on their first couple of albums ... but WHO did back then?!?! (Not The Beach Boys or The Mamas And The Papas, both Rock And Roll Hall Of Fame Members!) Their TV Series has never really been off the air these past 40 years ... and they STILL play out to sell-out crowds whenever and wherever they perform. NOTE: Finally nominated in 2009 for The Class of 2010. 12. Three Dog Night - Dominated the charts in the '70's, scoring 21 straight Top 40 Hits ... that's their ENTIRE chart history!!! One of the most ... if not THE most ... popular bands of the '70's. Pioneered the concept of a band with THREE lead singers! 13. Paul Anka - Canadian-born singer / songwriter ... dominated the teen pop scene in the '50's, became a more adult-oriented "standards" singer in the '60's and then came back with a whole new career in the '70's, scoring 35 Top 40 Hits over four decades. Plus, this guy wrote the theme to "The Tonight Show" and the Frank Sinatra classic, "My Way"!!! One of the very first artists smart enough to own his own masters! 14. Linda Ronstadt - There wasn't a style Linda couldn't sing ... and she successfully sang them ALL during her chart career. Along the way, she racked up 22 Top 40 Hits. (Sorry, Doug, but it's hard NOT to use Linda Ronstadt and SOME variable of the world "rack" in the same sentence!) Bonnie Raitt's in ... this year Laura Nyro is nominated ... yet Linda has never even been considered!!! How is this even possible?!?!? 15. Tommy James and the Shondells - '60's Pop Chart favorites ... and STILL going strong. In addition to his OWN chart success, Tommy's tunes were covered and then later hits for a number of artists in the '80's, proving this music to be timeless. Combined pop, rock, gospel, bubblegum and psychedelia into a sound distinctly and uniquely his own. 16. The Turtles - Pop favorites, The Turtles helped define a generation with feel good tunes like "Happy Together", "Elenore", "She'd Rather Be With Me", "You Showed Me", "You Baby", "It Ain't Me, Babe", "You Know What I Mean" and "She's My Girl" ... all '60's Pop Standards. 17. Paul Revere and the Raiders - Pop Stars, TV Stars, Concert headliners ... Mark Lindsay and Company scored 17 Top 40 Hits, most of which you STILL hear on the radio every day! A good percentage of Rock And Roll Music can ALSO be called "Feel Good" Music ... artists like Paul Revere and the Raiders, The Turtles and Tommy James and the Shondells EXCELLED at "Feel Good Music!" 18. Hall and Oates - The most successful duo of all time ... how is it possible that THESE guys are NOT in The Rock And Roll Hall Of Fame? Simon and Garfunkel are in ... The Everly Brothers are in ... Hall and Oates have had 30 Top 40 Hits and then, when they reunited a few years ago, were immediately back on the charts again! I don't know if there EVER was a better example of Rock 'n' Soul. 20. Yes - More Art-Rock at its finest and most innovative ... in fact, they helped to set the standard. 21. Neil Sedaka - Another one of the most popular songwriters of the rock era, Neil also scored a fair amount of his OWN pop hits, too ... 22 of which made The National Top 40. 22. The Zombies - Another British Invasion favorite ... they only had THREE Top 40 Hits but, boy, what hits those were ... timeless classics like "She's Not There", "Tell Her No" and "Time Of The Season". 23. Dionne Warwick - All Dionne Warwick did was provide the Soundtrack To Our Lives during the '60's ... speaking of which, where the heck are Burt Bacharach and Hal David ... certainly THEY belong in the Non-Performer category!!! 24. Heart - Talk about Women Who Rock ... The Sisters Wilson brought a WHOLE new meaning to the phrase! 25. Pat Benatar - Another female rocker who ABSOLUTELY deserves a spot in The Rock Hall! Heart and Pat Benatar DEFINE Rock And Roll ... they ARE Rock And Roll ... they LIVE it!!! Madonna, who was a shoe-in to get in on her first ballot ... and did, gave us DANCE music. Certainly there's a difference. Clearly, all THREE artists belong in The Rock And Roll Hall Of Fame ... why aren't Heart and Pat Benatar already there??? 26. The Doobie Brothers - Starting out as a Biker Band doing California Rock they launched a whole NEW career with the addition of keyboardist / vocalist Michael McDonald ... between the Tom Johnston years and the Michael McDonald years, The Doobies scored 18 Top 40 Hits, including a couple that went all the way to #1. 27. Bobby Rydell - A Pop Teen Idol who could actually sing ... and eventually even parlayed his success on to the silver screen. Bobby scored 19 Top 40 Hits. 28. Johnny Rivers - Whether he was interpreting another artist's songs ... or writing his own hits, Johnny Rivers never failed to please, scoring 21 Top 40 Hits in the process. 30. Glen Campbell - If you're not going to induct him on the basis of his OWN recording career (sure, he was a Country Artist first, but Campbell also scored 21 Top 40 Pop Hits), then you've GOT to induct him for the THOUSANDS of recording sessions he did back in the '60's. I mean, this guy played on EVERYTHING ... and was even a Beach Boy for a while!!! 31. Electric Light Orchestra - These guys gave new meaning to the term "Classic Rock", molding the best of classical music and rock into a whole new genre. 32. Styx - Another band that fused any number of styles into a sound that became distinctly their own. 33. Lesley Gore - One of the most popular female voices of the '60's, Lesley scored hit after hit. 35. Herman's Hermits - Another '60's British Invasion favorite. Their feel-good music sounds JUST as fresh today. And, Herman's Hermits scored 18 straight Top 40 Hits between 1964 and 1968 ... how many OTHER Rock And Roll Hall Of Famers can make THAT claim??? 37. Jim Croce - Giving whole new meaning to the term singer / songwriter ... as well as taking the role of "storyteller" to a whole new level, Croce's career was cut WAY to short. There is NO telling what else this man had in store for us. If you can't induct him for the greatness he showed us in his all too brief career, then induct him as yet another one of Rock And Roll's tragic heroes. And you may as well go right ahead and induct Croce's guitarist Maury Muehleisen into the Sidemen Category, too, because there was NO finer compliment to an artist than Maury's EXQUISET guitar-playing. He, too, sadly perished in the same plane crash as Big Jim. 40. Petula Clark - Another one of the most popular female voices of the '60's, Clark scored hit after hit after hit. THIS JUST IN: Scott Shannon will soon be airing a "Rock And Roll Hall Of Shame" Weekend on The True Oldies Channel, too ... featuring artists nominated by the True Oldies Listeners that they believe have been COMPLETELY overlooked by The Rock And Roll Hall Of Fame Nominating Committee. JUST GO THRU THE LIST OF ARTISTS WHO HAVE BEEN PLACED IN THE HALL SO FAR, AND TRY TO FIGURE OUT HOW SOME OF THE NAMES MADE IT IN BEFORE THESE PEOPLE; IT'S ABSOLUTELY MIND BOGGLING. EXAMPLES: LEONARD COHEN, PERCY SLEDGE, PATTI SMITH, GRAND MASTER FLASH, ETC. I KNOW THEY ARE ALL FINE ARTISTS, BUT DID THEY IMPACT POP MUSIC LIKE ANY OF THE NAMES LISTED ABOVE? Check out The Top 40 Deserving And Denied Artists nominated by OUR readers and you'll see that ALL of these artists made our list as well. Happy to pass this along ... and encourage our readers to send in THEIR nominees to: scott@trueoldieschannel.com. When will Bobby Vee be nominated? His career spans over 40 years and he's still rocking in casinos, State Fair concerts and big and small Venues ... He had the hits and the gold records. In 1999 we delivered a petition with over 10,000 signatures on it asking for him to be nominated to "The Rock and Roll Hall of Fame to the Cleveland headquarters. There were signatures of some big 60's groups and individual artists as well as a lot of fans ... yet after all these years, STILL no nomination. What a shame. Such a nice guy, loved by his fans and he takes care of them. Respected by other artists. I agree with you on this year's nominees, and your daughter's observation of The Red Hot Chili Peppers. Show the ugly politics of the Hall. Keep Rockin' and keep the faith. The Peppers released their first, eponymous LP in 1984. That makes 'em eligible. Doesn't make 'em worthy. Hey, I like 'em, but . . .
As for the Hollies --- It's about damned time!! They'd better get in. Donna Summer; Kiss; Abba; Hollies; Darlene Love (because if Phil can get in for producing records, then Darlene should be there for being his instrument – under several titles). Regarding the R&RHOF nominees, if you actually make a qualifier for the HOF to have made Rock 'n' Roll Music, about half of the nominees wouldn’t qualify. To me it’s a pretty sad list. Donna Summer isn’t Rock no matter how you cut it, and they should stop putting in all this fringe crap, while ignoring the real thing! If they don’t finally get the Hollies in, they are insane, but that’s kind of a given, considering all the drek they are filling it up with. Let’s all get our Girls and go dancin’ to LL Cool j. Yeah Baby! Shheeshh! Hollies -- I love them. My heart says put them in. In England they were much more popular than here. Stooges -- I consider myself a well rounded rock and roll fan that's been exposed to many genres of music ... I've heard Iggy Pop solo but am not familiar with any Stooges material. I cannot consider them RRHOF worthy when so few people [I'd say less than 2 percent] have even heard them once. LL Cool J -- popular 80s rap artist -- I guess he would rank third in the 80s after Grandmaster and Run DMC. Is Salt N Pepa next? Chantels -- the first popular female vocal group - fit in with the doo wop groups though an early influence of the girl group sound. Short but excellent hit making career. Darlene Love -- made many excellent records in 1962-1963. The voice of the Wall Of Sound. Sang background vocals on all sorts of hit records. Definitely belongs as a contributing artist. As great as her records were, they were unfortunately not all that popular. I think I just talked myself into wanting to elect her. Jimmy Cliff -- might rank as the #2 most important reggae artist. I guess that's a good case for him. Here's my handicapping of the Jann Wenner and Cronies Hall of Fame: LL Cool J will be the rapper chosen (like Run DMC), Laura Nyro the composer who never had a hit on her own (like Leonard Cohen) and the Red Hot Chili Peppers the recent artist (like Madonna). They will toss a bone to the Hollies (like they finally did with the DC 5). Darlene Lovecan't be blackballed by Phil Spector anymore and she's "in" with people like Paul Schaeffer, so she'll make it, too. The Chantels were nominated before -- in 2002. Clearly there's enough oldies fans on the nominating committee to get them this far. But I have to ask, "Why them? Why not Connie Francis or Neil Sedaka or Neil Diamond or...??" The Stooges have been nominated eight times. Don't be surprised if Jann Wenner finds some way to slip them in -- hopefully not by pulling a "DC5" on the Hollies. So glad to hear The Chantels made the Rock and Roll Hall of Fame!!! They are best know for their ballad "Maybe" that reached a high of #2 in 1958. Its sound influenced producers and musicians. They followed with records that never reached that high status, but made a comeback in 1960 with their hit "Look In My Eyes" (one of my favorites). Congratulations to a real pioneer group of Rock and Roll!! About the only thing I can say as to the 2010 Rock Hall nominees: well, at least they recognized Darlene Love. I mean, give me a break. It took them this long to recognize one of the most talented and distinctive vocalists of the 20th Century? I mean she's only been singing on hit records since 1962. Gee, that's ONLY forty-seven years. And, like The Beach Boys, she's from Hawthorne, California, no less. Did you keep her waiting long enough, Jann? Yea, I'm pleased The Hollies got in, even Jimmy Cliff. I'm amazed the "Queen of Disco" made it past the Jann Wenner Memorial Screening Committee. What? Jann salutes "disco" again? I thought he despised the genre. I thought that was what kept the Bee Gees out for so many years. Hard to keep out ABBA, ditto, Genesis. The late Laura Nyro represents the annual 'hip factor' -- kinda like Leonard who?? from the Class of '08. I might even stretch and say The Chili Peppers deserve it --- but NOT for another few years, ditto KISS. As to 'early influences,' I'll accept The Chantels -- if they promise to induct The Crickets and The Rock and Roll Trio in 2011. Fair enough? So, once again, us die-hards wait for Chicago, Jan & Dean, Quincy Jones, Brian Wilson, Paul Revere and The Raiders, and at least another dozen 'stars' that are far more worthy and deserving than "The Stooges" and "LL Cool J." As far as Pat Boone making it -- the guy that introduced MILLIONS of white kids to 'black music' in the mid and late 1950's, well, Pat -- even though those white bucks are a bit dirty and out of fashion -- we'll continue to remember you! You're still one of my heroes. Kiss makes sense ... they helped to bring a whole new genre of glam rock to the forefront. As long as Jann Wenner is on the committee, Kiss will NEVER make it into the R&R Hall of Fame! They never got any respect (or any covers of) Rolling Stone!And where are The Monkees?? In my opinion, Darlene Love DOES deserve her spot in the RRHOF, as do KISS, The Hollies, ABBA, Genesis, Jimmy Cliff & Donna Summer. I can name 3 of Darlene's solo hits, right off the top of my pointed little head, "Wait 'Til My Bobby Gets Home", "Christmas Baby (Please Come Home)" and "Today I Met The Boy I'm Gonna Marry". She sang lead on "He's A Rebel" that producer Phil Spector credited to The Crystals as well as being a member of Bob B. Soxx & The Blue Jeans, plus her group The Blossoms sang back up on dozens of hits, including Duane Eddy's "(Dance With) The Guitar Man" plus the fact that she's a staple on Letterman's annual Christmas show, so she's still in the public eye at least once a year. On top of all that, she's a wonderful person and an excellent interview (I interviewed her a few years back, and she gave me very honest answers to some probing questions). The Chantels and Laura Nyro deserve their spots as well, but c'mon - LL Cool J, and The Red Hot Chili Peppers going in before artists like Neil Diamond, Quincy Jones, or even Carole Kaye (the only female member of The Wrecking Crew) who played bass on hundreds of hits over the years. It's like the nominating committee (yeah, I know it's really only one guy who makes these final decisions), picked one from column A (disco), one from column B (British 'art/rock' groups), one from column C (reggae artists), etc. Sad that so many classic acts are being overlooked and ignored. But I don't want to get Kent started on all that again. Well, I'll never listen to "Wedding Bell Blues" the same way again. The song was written by Laura Nyro, so we asked Alan Merrill if there really was a "Bill." co- wrote "I Love Rock And Roll." I'll hit you with that story another time, but as for "Wedding Bell Blues,"
Around 1958 or so my mom (the Jazz singer Helen Merrill) was dating a married man named Bill Carter, a b-film actor. He was married to Trink Wiman, heiress to the John Deere fortune. My mom and Bill co-owned a jazz club named The Night Owl (not the Greenwich Village rock venue) and were having a very passionate and public relationship. The club was quite possibly funded by Ms. Wiman's money. The affair was so serious in fact that Trink had private detectives invade our apartment at 1040 Park Avenue in '59, I was there and remember it. The ensuing newspaper scandal was the reason we left to reside in Europe for many years. This was big family gossip of course, and Laura listened to it as a child and later wrote about it. My mother could never marry Bill, and didn't. Her timing was bad. Seeing a married man was a big deal in the '50s, but that the wife was such a wealthy heiress upped the ante. The affair ultimately cost Carter his marriage in 1960, with Wiman divorcing him, I guess Carter blamed my mom for his losing his grip on Wiman's fortune, and their relationship soured. He met and married actress Elaine Stewart, that is after breaking up with my mom in Europe sometime around in 1961 while I was in boarding school. My mother seethes at the mention of his name now and refuses to discuss him, although she did confirm the story of the affair (and Laura admitting to her that it was the inspiration for the song) when interviewed in Michele Kort's book about Laura's life. My mom was not amused at Laura's incisive lyric, but in fact Laura was an investigative journalist as an artist and got the story spot-on in the song. A zinger from my mom's perspective, but a big winner in terms of sale for Laura! Hope you're doing well. Have not had enough time these last two months to read each and every article, link, comment, etc., in your wonderful newsletter. However, in going through some old e-mails, I found a link to the current Nominees for the Hit Parade Hall of Fame, which I did click and voted for several. I could not find where it set a limit as to the number of votes you have. In the process I overlooked "Chicago" as being a 2008 inductee and clicked on yet another link to send in additional nominees. I included Jan and Dean, Chicago, and my late and dear friend, Ray Peterson on that form. So, if you have John's e-mail addy, please send it along. John Rook's website would take DAYS to thoroughly peruse ... SO much information on there, including excerpts from his forthcoming book ... and reminisces about SO much from the early days of rock and roll ... definitely worth the trip. Meanwhile, the best way to reach him ... especially in matters pertaining to The Hit Parade Hall Of Fame ... you can always drop John a line at jr@hitparadehalloffame.org ... he LOVES hearing from other music fans out there! Stay tuned tomorrow as we rerun our list of The Top 40 Deserving And Denied Artists Overlooked by The Rock And Roll Hall Of Fame Nominating Committee! EXCLUSIVELY here on The Forgotten Hits Web Page!